The Corridor of Discernity: Mystery spinner? It's all in the mind, the batsman's that is..
Mystery spinner? It's all in the mind, the batsman's that is.. It was always going to be an impossible task. After a handful of first-class matches and one season of IPL, how could we reasonably expect anything special on a Test debut? A debut made against one of the strongest batting line-ups and in conditions which could not be more different to those of Trinidad, the West Indies as a whole or even India. And yet it was impossible not to feel disappointed, maybe even a touch let down, as Kevin Pietersen laid into Sunil Narine's increasingly friendly offerings on Sunday afternoon. Why should we take it personally? Maybe its because in this age of cynicism the opportunities to dream, to experience awe and wonder seem increasingly fleeting. Perhaps it's why the lure of a great magician remains, even if they must come up with ever greater illusions to grab and retain our attentions. 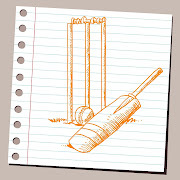 Put simply, people still love a good mystery and in cricket that means spinners. But a good mystery requires that the intrigue endures. And unless you are a fan of Columbo that means not finding out who did it in the opening scene. On Sunday, it seemed that Narine had been arrested, charged and was awaiting sentencing even before Nick Knight in the Sky box had time to begin his prosecution-by-video. Given that Narine's unveiler was Pietersen, a man who singularly and admittedly failed to solve the riddle of Saeed Ajmal, this was more the equivalent of being caught by PC Plod than Hercule Poirot. The term "mystery spinner" may not have been coined by Gideon Haigh but it was best and most appropriately used as the title of his wonderful biography of Jack Iverson. Everything about Iverson was a mystery, sometimes even to himself. Deeply insecure about his own special talent, he continually fretted that he had been "found out". Whether this was objectively true of Iverson is another question but Narine's inauspicious debut brings to mind Ajantha Mendis, widely considered to have been "found out" after a promising beginning. Both Narine and Mendis bowl a "carrom" ball, as nominally did Iverson (although Haigh's description suggests that his huge hands created altogether more vigorous spin) and both have enjoyed success in T20 cricket on the sub-continent. But under polar opposite circumstances, a Test match in England, they have looked anything but mysterious. Whilst Mendis has currently faded from view, that is not necessarily the fate that awaits Narine. For one thing they are actually quite different bowlers despite their signature deliveries. Mendis' bowling relies on a number of subtle variations and great accuracy. Big turn was never his thing. Narine by contrast is less accurate but really spins it. In a spell littered with short deliveries he extracted more turn with his stock off-break than Graeme Swann had done earlier in the day. And whilst his carrom ball may not have turned at Edgbaston, it only takes a couple of clicks to find evidence of it doing so, and sharply at that. Accuracy can be worked on, the ability to spin the ball hard is talent. But what about the mystery? Once lost can it ever be regained? If we are talking mechanics, then in the age of video analysis, prolonged mystery is tough to achieve (although Ajmal is giving it a good shot). But mystery is more than mechanics and so is spin bowling. Although never referred to as such, Shane Warne is the greatest mystery spinner the world has ever known. He understood that mystery or deception, which is what we are really talking about, isn't found merely in the act of delivery but can be created anywhere and at anytime. In fact most of Warne's mystery wasn't even created on the pitch but in television interviews and press conferences, sowing the seeds of doubt in batsmen' with claims of new deliveries. He then used his natural talent to compound and reinforce these doubts on the field. Sunil Narine is no Warne but the lesson remains the same. If he can instill doubt in a batsman's mind and keep it there his mystery will never be solved. yes, it is all in the mind, because the mind can be unsettled and less able to cope with normal deliveries as a result. it is difficult to play shot on spin bowler ball.